— An Ohio reporter covering the negotiations at Medicine Lodge, Kansas on October 27, 1867. 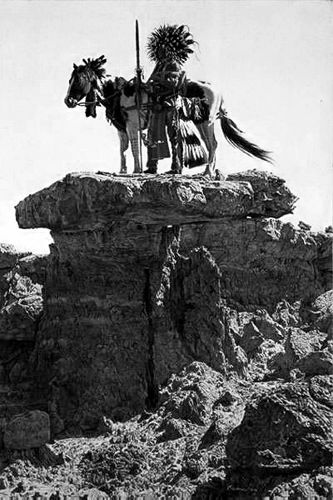 Of all the typical Plains tribes, the Cheyenne were most distinguished for warlike qualities. Few in number, they overcame or held in check most of the peoples who opposed them, and when the westward movement of European civilization began, they made more trouble than all the rest combined. In short, they were preeminently warriors among peoples whose trade was war. 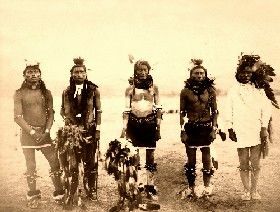 As in other prairie tribes, the warriors of the Cheyenne were organized into societies or orders. These societies were fraternal, military, and semi-religious organizations with special privileges, duties, and dress, usually tracing their origin to some mythical culture hero or medicine man. Each society had its own songs and secret ritual, and exacted certain observances and standards of its members. Of these organizations, none has played such a part in the history of the Plains as the “Dog Soldiers” of the Cheyenne. It is the purpose of this short paper to outline the origin, customs and history of this society of warriors. “The Dog-Man (Dog Soldier) Society was organized after the organization of the other societies, by a young man without influence, but who was chosen by the great Prophet. One morning the young man went through the entire camp and to the center of the camp circle, announcing that he was about to form a society. No one was anxious to join him, so he was alone all that day. The other medicine-men had had no difficulty in establishing their societies, but this young man, when his turn came to organize, was ridiculed, for he was not a medicine-man, and had no influence to induce others to follow his leadership. At evening he was sad, and he sat in the midst of the whole camp. He prayed to the Great Prophet and the Great Medicine Man to assist him. At sunset he began to sing a sacred song. While he sang the people noticed that now and then the large and small dogs throughout the camp whined and howled and were restless. The people in their lodges fell asleep. The man sang from sunset to midnight; then he began to wail. The people were all sleeping in their lodges and did not hear him. Again he sang; then he walked out to the opening of the camp-circle, singing as he went. At the opening of the camp-circle he ceased singing and went out. All the dogs of the whole camp followed him, both male and female, some carrying in their mouths their puppies. Four times he sang before he reached his destination at daybreak. As the sun rose he and all the dogs arrived at a river bottom which was partly timbered and level. The man sat down by a tree that leaned toward the north. Immediately the dogs ran from him and arranged themselves in the form of a semi-circle about him, like the shape of the camp-circle they had left; then they lay down to rest; as the dogs lay down, by some mysterious power, there sprang up over the man in the center of the circle a lodge. The lodge included the leaning tree by which the man sat; there were three other saplings, trimmed at the base with the boughs left at the top. The lodge was formed of the skins of the buffalo. As soon as the lodge appeared, all the dogs rushed towards it. As they entered the lodge they turned into human beings, dressed like members of the Dog-Men Society. The Dog Men began to sing, and the man listened very attentively and learned several songs from them, their ceremony, and their dancing forms. Later, the Cheyenne discovered the camp. But “as they came into view of the wonderful camp the Dog lodge instantly disappeared and the Dog-Men were transformed into dogs. The medicine-men and warriors were by this time very sorry that they had refused to join this man’s society—and the next day, according to instructions of the Great Prophet, he again asked the warriors to join his society, and many hundreds of men joined it. He directed the society to imitate the Dog Man in dress, and to sing the way the Dog-Men sang. This is why the other warrior societies call the warriors of this society ‘Dog-Men Warriors’.” So much for the fabulous origin of the organization. The uniform of the society consisted of a bonnet covered with upright feathers of birds of prey, a whistle suspended from a thong round the neck and made of the wing bone of an eagle, leggings, breechclout, and moccasins. The belt was made of four skunk skins. The Dog Soldiers carried a bow and arrows and a rattle shaped like a snake was used to accompany their songs. They had one chief and seven assistants, of whom four were leaders in battle, chosen on account of their extraordinary courage. These four wore, in addition to the usual uniform, a long sash which passed over the right shoulder and hung to the ground under the left arm, decorated with porcupine quills and eagle feathers. Of these four men the two bravest had their leggings fringed with human hair. The society has a secret ritual which occupies four days, and has a series of four hundred songs used in its ceremonies and dances. It was often called upon to perform police duties in a large camp, and enjoyed certain privileges in the tribe, such as the right to kill any fat dog whenever a feast was in order. The powers of a warrior society in doing police duty were great, and their punishments severe against those who violated camp regulations. Not infrequently they whipped delinquents with quirts, beat them with clubs, or killed their ponies. For small offenses they might cut up a man’s robe, break his lodge poles, or slash his tipi cover. They had charge of the tribal buffalo hunt, and saw to it that the rules governing the hunt were observed and that all men had an equal chance to kill meat. They prevented any individual hunting until after the needs of the camp had been supplied. About 1830 all the men of a certain Cheyenne band and (Masiskota) joined the Dog Soldiers in a body. 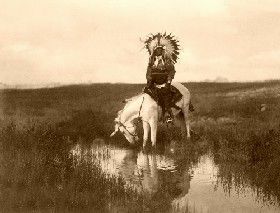 Since that time the society has comprised about half the men in the tribe, and has been the most distinct, important, and aggressive of all the warrior societies of the Cheyenne. In fact, the name of the tribe, Cheyenne, has by some been derived from the French chien, in direct allusion to the organization, through this derivation is now discredited by the best authorities.